✔Emphasize Romantic Atmosphere: The Artificial Silk Red Rose Petals Wedding Flower Decoration, enough to make your weddings party or proposing more romantic and memorable, they will also be perfect used in celebration, special festive decorations such as Valentine\'s Day, wedding anniversary, birthdays, candlelight dinner, romantic night, classic candy buffets, dessert tables and more. It can be reusable after your event. ✔Number of Rose Petals: The wedding decoration contains 2200pcs rose petals, which can help you gain a long and nice petals path way on your wedding or several love shapes for your proposing. 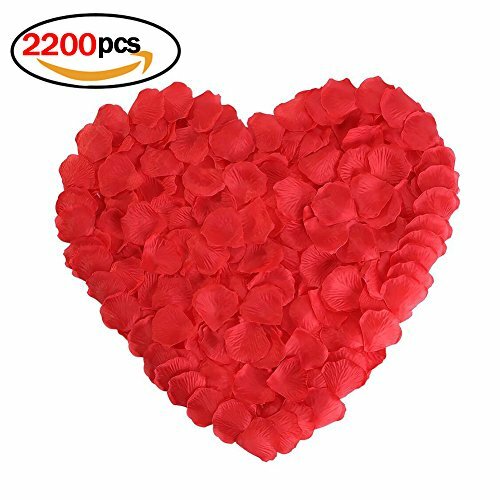 ✔Vivid Color: The rose petals\' color is vivid, which makes the petals more realistic and perfect to avoid the mess of real petals, very photogenic. You will receive exactly what is shown in the picture- nothing more and nothing less. ✔Premium Material: Our red rose petals are made of high quality polyester silk. They are light weight, realistic. No toxic, no deformation and no fading. ✔Non-irritating Fabric: Someone may be allergic to real rose, but our fake rose petals can avoid the happening of allergy to real rose, and also provide your romantic feeling as the real one. Un oggetto utile per i momenti piú romantici, costituito da buoni materiali e riutilizzabile piú volte. Consigliato!